Hands up who likes Donna Hay and her easy, simple recipes? She is one of Australia's leading food editor and best selling cookbook author. I love her magazines filled with beautiful photographed food which makes one drool just by looking at the photos. She started her career as a food writer and stylist. She was also the food editor with marie claire lifestyle. Just recently, Donna started her own cooking series - Fast, Simple Fresh - on the Lifestyle Food channel on Foxtel (Pay TV). Here's one of her recipes from her lifestyle cooking program, which I have taken from here. I have tweaked the recipe slightly to suit our tastes. It's a easy to make and tastes delicious. The pie will go well if served with some salad on the side as a vegetarian lunch. Brush each filo sheet with butter and place one on top of the other. Cut the stack of pastry sheets in half so you have 2 rectangles and place on baking trays lined with non-stick baking paper. Squeeze the excess liquid from the spinach and place in a bowl with the ricotta, eggs, Parmesan, mint, salt and pepper and mix to combine. Divide the filling between the two pastries leaving a 5cm border. Fold over the pastry edges to form a border. 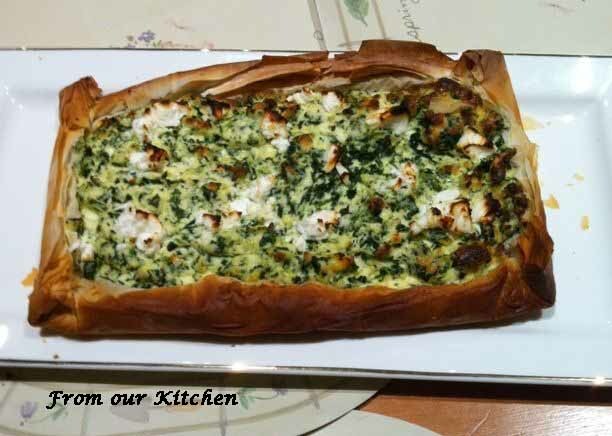 Sprinkle the filling with feta. Bake for 25 minutes or until pastry is golden and filling has set. sometimes i swear you can read my mind! every time i think of making something...a recipe will pop up on your blog using the same ingredient that has been in my mind. this time, i'm trying hard to think of something to make using the phyllo sheets and then i see this. i find it really strange and funny. thanks for this!!! the pie looks fantastic. Love the simple recipe!! I've heard of Donna Hay but have never tried or seen her recipes so far (or maybe I did, but didn't realise it ;)). Have a wonderful weekend :)! Tania: Must be the cook's ESP. Let me know how your pie turns out. CG: You may have come across her recipes and not realised. She used to write for Marie Claire recipe books. That really looks and sounds good!